Pierre de Frédy, Baron de Coubertin (French: [pjɛʁ də kubɛʁtɛ̃]; born Pierre de Frédy; 1 January 1863 – 2 September 1937, also known as Pierre de Coubertin and Baron de Coubertin) was a French educator and historian, and founder of the International Olympic Committee, and its second President. He is considered one of the fathers of the modern Olympic Games. Born into a French aristocratic family, he became an academic and studied a broad range of topics, most notably education and history. He graduated with a degree in law and public affairs Paris Institute of Political Studies (Sciences Po). It was at Sciences Po that he came up with the idea of the Summer Olympic Games. The Pierre de Coubertin medal (also known as the Coubertin medal or the True Spirit of Sportsmanship medal) is an award given by the International Olympic Committee to athletes who demonstrate the spirit of sportsmanship in the Olympic Games. Pierre de Frédy was born in Paris on 1 January 1863, into an aristocratic family. He was the fourth child of Baron Charles Louis de Frédy, Baron de Coubertin and Marie–Marcelle Gigault de Crisenoy. Family tradition held that the Frédy name had first arrived in France in the early 15th century, and the first recorded title of nobility granted to the family was given by Louis XI to an ancestor, also named Pierre de Frédy, in 1477. But other branches of his family tree delved even further into French history, and the annals of both sides of his family included nobles of various stations, military leaders and associates of kings and princes of France. Pierre de Coubertin as a child (right), with one of his sisters, painted by his father Charles Louis de Frédy, Baron de Coubertin (detail of Le Départ, 1869). His father Charles was a staunch royalist and accomplished artist whose paintings were displayed and given prizes at the Parisian salon, at least in those years when he was not absent in protest of the rise to power of Louis Napoleon. His paintings often centred on themes related to the Roman Catholic Church, classicism, and nobility, which reflected those things he thought most important. In a later semi-fictional autobiographical piece called Le Roman d'un rallié, Coubertin describes his relationship with both his mother and his father as having been somewhat strained during his childhood and adolescence. His memoirs elaborated further, describing as a pivotal moment his disappointment upon meeting Henri, Count of Chambord, whom the elder Coubertin believed to be the rightful king. Coubertin grew up in a time of profound change in France: France's defeat in the Franco-Prussian War, the Paris Commune, and the establishment of the French Third Republic, and later the Dreyfus affair. But while these events were the setting of his childhood, his school experiences were just as formative. In October 1874, his parents enrolled him in a new Jesuit school called Externat de la rue de Vienne, which was still under construction for his first five years there. While many of the school's attendees were day students, Coubertin boarded at the school under the supervision of a Jesuit priest, which his parents hoped would instill him with a strong moral and religious education. There, he was among the top three students in his class, and was an officer of the school's elite academy made up of its best and brightest. This suggests that despite his rebelliousness at home, Coubertin adapted well to the strict rigors of a Jesuit education. As an aristocrat, Coubertin had a number of career paths from which to choose, including potentially prominent roles in the military or politics. But he chose instead to pursue a career as an intellectual, studying and later writing on a broad range of topics, including education, history, literature and sociology. The subject which he seems to have been most deeply interested in was education, and his study focused in particular on physical education and the role of sport in schooling. In 1883, he visited England for the first time, and studied the program of physical education instituted by Thomas Arnold at the Rugby School. Coubertin credited these methods with leading to the expansion of British power during the 19th century and advocated their use in French institutions. The inclusion of physical education in the curriculum of French schools would become an ongoing pursuit and passion of Coubertin's. Coubertin is thought to have exaggerated the importance of sport to Thomas Arnold, whom he viewed as "one of the founders of athletic chivalry". The character-reforming influence of sport with which Coubertin was so impressed is more likely to have originated in the novel Tom Brown's School Days rather than exclusively in the ideas of Arnold himself. Nonetheless, Coubertin was an enthusiast in need of a cause and he found it in England and in Thomas Arnold. "Thomas Arnold, the leader and classic model of English educators," wrote Coubertin, "gave the precise formula for the role of athletics in education. The cause was quickly won. Playing fields sprang up all over England". Intrigued by what he had read about English public schools, in 1883, at the age of twenty, Frédy went to Rugby and to other English schools to see for himself. He described the results in a book, L'Education en Angleterre, which was published in Paris in 1888. This hero of his book is Thomas Arnold, and on his second visit in 1886, Coubertin reflected on Arnold's influence in the chapel at Rugby School. What Coubertin saw on the playing fields of Rugby and the other English schools he visited was how "organised sport can create moral and social strength". Not only did organised games help to set the mind and body in equilibrium, it also prevented the time being wasted in other ways. First developed by the ancient Greeks, it was an approach to education that he felt the rest of the world had forgotten and to whose revival he was to dedicate the rest of his life. As a historian and a thinker on education, Coubertin romanticised ancient Greece. Thus, when he began to develop his theory of physical education, he naturally looked to the example set by the Athenian idea of the gymnasium, a training facility that simultaneously encouraged physical and intellectual development. He saw in these gymnasia what he called a triple unity between old and young, between disciplines, and between different types of people, meaning between those whose work was theoretical and those whose work was practical. Coubertin advocated for these concepts, this triple unity, to be incorporated into schools. But while Coubertin was certainly a romantic, and while his idealised vision of ancient Greece would lead him later to the idea of reviving the Olympic Games, his advocacy for physical education was based on practical concerns as well. He believed that men who received physical education would be better prepared to fight in wars, and better able to win conflicts like the Franco-Prussian War, in which France had been humiliated. He also saw sport as democratic, in that sports competition crossed class lines, although it did so without causing a mingling of classes, which he did not support. Unfortunately for Coubertin, his efforts to incorporate more physical education into French schools failed. The failure of this endeavour, however, was closely followed by the development of a new idea, the revival of the ancient Olympic Games, the creation of a festival of international athleticism. He was the referee of the first ever French championship rugby union final on 20 March 1892, between Racing Club de France and Stade Français. Coubertin is the instigator of the modern Olympic movement, a man whose vision and political skill led to the revival of the Olympic Games which had been practised in antiquity. Coubertin idealized the Olympic Games as the ultimate ancient athletic competition. Thomas Arnold, the Head Master of Rugby School, was an important influence on Coubertin's thoughts about education, but his meetings with William Penny Brookes also influenced his thinking about athletic competition to some extent. A trained physician, Brookes believed that the best way to prevent illness was through physical exercise. In 1850, he had initiated a local athletic competition that he referred to as "Meetings of the Olympian Class" at the Gaskell recreation ground at Much Wenlock, Shropshire. Along with the Liverpool Athletic Club, who began holding their own Olympic Festival in the 1860s, Brookes created a National Olympian Association which aimed to encourage such local competition in cities across Britain. These efforts were largely ignored by the British sporting establishment. Brookes also maintained communication with the government and sporting advocates in Greece, seeking a revival of the Olympic Games internationally under the auspices of the Greek government. There, the philanthropist cousins Evangelos and Konstantinos Zappas had used their wealth to fund Olympics within Greece, and paid for the restoration of the Panathinaiko Stadium that was later used during the 1896 Summer Olympics. The efforts of Brookes to encourage the internationalization of these games came to naught. However, Dr. Brookes did organize a national Olympic Games in London, at Crystal Palace, in 1866 and this was the first Olympics to resemble an Olympic Games to be held outside of Greece. 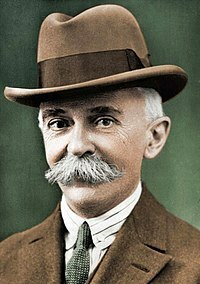 But while others had created Olympic contests within their countries, and broached the idea of international competition, it was Coubertin whose work would lead to the establishment of the International Olympic Committee and the organisation of the first modern Olympic Games. In 1888, Coubertin founded the Comité pour la Propagation des Exercises Physiques more well known as the Comité Jules Simon. Coubertin's earliest reference to the modern notion of Olympic Games criticizes the idea. The idea for reviving the Olympic Games as an international competition came to Coubertin in 1889, apparently independently of Brookes, and he spent the following five years organizing an international meeting of athletes and sports enthusiasts that might make it happen. Dr Brookes had organised a national Olympic Games that was held at Crystal Palace in London in 1866. In response to a newspaper appeal, Brookes wrote to Coubertin in 1890, and the two began an exchange of letters on education and sport. Although he was too old to attend the 1894 Congress, Brookes would continue to support Coubertin's efforts, most importantly by using his connections with the Greek government to seek its support in the endeavour. While Brookes' contribution to the revival of the Olympic Games was recognised in Britain at the time, Coubertin in his later writings largely neglected to mention the role the Englishman played in their development. He did mention the roles of Evangelis Zappas and his cousin Konstantinos Zappas, but drew a distinction between their founding of athletic Olympics and his own role in the creation of an international contest. However, Coubertin together with A. Mercatis, a close friend of Konstantinos, encouraged the Greek government to utilise part of Konstantinos' legacy to fund the 1896 Athens Olympic Games separately and in addition to the legacy of Evangelis Zappas that Konstantinos had been executor of. Moreover, George Averoff was invited by the Greek government to fund the second refurbishment of the Panathinaiko Stadium that had already been fully funded by Evangelis Zappas forty years earlier. As Coubertin prepared for his Congress, he continued to develop a philosophy of the Olympic Games. While he certainly intended the Games to be a forum for competition between amateur athletes, his conception of amateurism was complex. By 1894, the year the Congress was held, he publicly criticised the type of amateur competition embodied in English rowing contests, arguing that its specific exclusion of working-class athletes was wrong. While he believed that athletes should not be paid to be such, he did think that compensation was in order for the time when athletes were competing and would otherwise have been earning money. Following the establishment of a definition for an amateur athlete at the 1894 Congress, he would continue to argue that this definition should be amended as necessary, and as late as 1909 would argue that the Olympic movement should develop its definition of amateurism gradually. Along with the development of an Olympic philosophy, Coubertin invested time in the creation and development of a national association to coordinate athletics in France, the Union des Sociétés Françaises de Sports Athlétiques (USFSA). In 1889, French athletics associations had grouped together for the first time and Coubertin founded a monthly magazine La Revue Athletique, the first French periodical devoted exclusively to athletics and modelled on The Athlete, an English journal established around 1862. Formed by seven sporting societies with approximately 800 members, by 1892 the association had expanded to 62 societies with 7,000 members. That November, at the annual meeting of the USFSA, Coubertin first publicly suggested the idea of reviving the Olympics. His speech met general applause, but little commitment to the Olympic ideal he was advocating for, perhaps because sporting associations and their members tended to focus on their own area of expertise and had little identity as sportspeople in a general sense. This disappointing result was prelude to a number of challenges he would face in organising his international conference. In order to develop support for the conference, he began to play down its role in reviving Olympic Games and instead promoted it as a conference on amateurism in sport which, he thought, was slowly being eroded by betting and sponsorships. This led to later suggestions that participants were convinced to attend under false pretenses. Little interest was expressed by those he spoke to during trips to the United States in 1893 and London in 1894, and an attempt to involve the Germans angered French gymnasts who did not want the Germans invited at all. Despite these challenges, the USFSA continued its planning for the games, adopting in its first program for the meeting eight articles to address, only one of which had to do with the Olympics. A later program would give the Olympics a much more prominent role in the meeting. The congress was held on 23 June 1894 at the Sorbonne in Paris. Once there, participants divided the congress into two commissions, one on amateurism and the other on reviving the Olympics. A Greek participant, Demetrius Vikelas, was appointed to head the commission on the Olympics, and would later become the first President of the International Olympic Committee. Along with Coubertin, C. Herbert of Britain's Amateur Athletic Association and W.M. Sloane of the United States helped lead the efforts of the commission. In its report, the commission proposed that Olympic Games be held every four years and that the program for the Games be one of modern rather than ancient sports. They also set the date and location for the first modern Olympic Games, the 1896 Summer Olympics in Athens, Greece, and the second, the 1900 Summer Olympics in Paris. Coubertin had originally opposed the choice of Greece, as he had concerns about the ability of a weakened Greek state to host the competition, but was convinced by Vikelas to support the idea. The commission's proposals were accepted unanimously by the congress, and the modern Olympic movement was officially born. The proposals of the other commission, on amateurism, were more contentious, but this commission also set important precedents for the Olympic Games, specifically the use of heats to narrow participants and the banning of prize money in most contests. Following the Congress, the institutions created there began to be formalized into the International Olympic Committee (IOC), with Demetrius Vikelas as its first President. The work of the IOC increasingly focused on the planning the 1896 Athens Games, and de Coubertin played a background role as Greek authorities took the lead in logistical organisation of the Games in Greece itself, offering technical advice such as a sketch of a design of a velodrome to be used in cycling competitions. He also took the lead in planning the program of events, although to his disappointment neither polo, football, or boxing were included in 1896. The Greek organizing committee had been informed that four foreign football teams were to participate however not one foreign football team showed up and despite Greek preparations for a football tournament it was cancelled during the Games. The Greek authorities were frustrated that he could not provide an exact estimate of the number of attendees more than a year in advance. In France, Coubertin's efforts to elicit interest in the Games among athletes and the press met difficulty, largely because the participation of German athletes angered French nationalists who begrudged Germany their victory in the Franco-Prussian War. Germany also threatened not to participate after rumours spread that Coubertin had sworn to keep Germany out, but following a letter to the Kaiser denying the accusation, the German National Olympic Committee decided to attend. Coubertin himself was frustrated by the Greeks, who increasingly ignored him in their planning and who wanted to continue to hold the Games in Athens every four years, against de Coubertin's wishes. The conflict was resolved after he suggested to the King of Greece that he hold pan-Hellenic games in between Olympiads, an idea which the King accepted, although Coubertin would receive some angry correspondence even after the compromise was reached and the King did not mention him at all during the banquet held in honour of foreign athletes during the 1896 Games. Coubertin took over the IOC presidency when Demetrius Vikelas stepped down after the Olympics in his own country. Despite the initial success, the Olympic Movement faced hard times, as the 1900 (in De Coubertin's own Paris) and 1904 Games were both swallowed by World's Fairs in the same cities, and received little attention. The Paris Games were not organised by Coubertin or the IOC nor were they called Olympics at that time. The St. Louis Games was hardly internationalized. The 1906 Summer Olympics revived the momentum, and the Olympic Games have come to be regarded as the world's foremost sports competition. Coubertin created the modern pentathlon for the 1912 Olympics, and subsequently stepped down from his IOC presidency after the 1924 Olympics in Paris, which proved much more successful than the first attempt in that city in 1900. He was succeeded as president, in 1925, by Belgian Henri de Baillet-Latour. Years later Coubertin came out of retirement to lend his prestige to assisting Berlin to land the 1936 games. In exchange, Germany nominated him for the Nobel Peace Prize. The 1935 winner, however, was the anti-Nazi Carl von Ossietzky. Coubertin won the gold medal for literature at the 1912 Summer Olympics for his poem Ode to Sport. In 1911, Pierre de Coubertin founded the inter-religious Scouting organisation aka Éclaireurs Français (EF) in France, which later merged to form the Éclaireuses et Éclaireurs de France. In 1895 Pierre de Coubertin had married Marie Rothan, the daughter of family friends. Their son Jacques (1896–1952) became ill after being in the sun too long when he was a little child. Their daughter Renée (1902–1968) suffered emotional disturbances and never married. Marie and Pierre tried to console themselves with two nephews, but they were killed at the front in World War I. Coubertin died of a heart attack in Geneva, Switzerland on 2 September 1937. Marie died in 1963. Pierre was the last person to the family name. In the words of his biographer John MacAloon, "The last of his lineage, Pierre de Coubertin was the only member of it whose fame would outlive him." A number of scholars have criticized Coubertin's legacy. David C. Young believes that Coubertin's assertion that ancient Olympic athletes were amateurs was incorrect. The issue is the subject of scholarly debate. Young and others argue that the athletes of the ancient Games were professional, while opponents led by Pleket argue that the earliest Olympic athletes were in fact amateur, and that the Games only became professionalized after about 480 BC. Coubertin agreed with this latter view, and saw this professionalization as undercutting the morality of the competition. Further, Young asserts that the effort to limit international competition to amateur athletes, which Coubertin was a part of, was in fact part of efforts to give the upper classes greater control over athletic competition, removing such control from the working classes. Coubertin may have played a role in such a movement, but his defenders argue that he did so unconscious of any class repercussions. However, it is clear that his romanticized vision of the Olympic Games was fundamentally different from that described in the historical record. For example, Coubertin's idea that participation is more important than winning ("L'important c'est de participer") is at odds with the ideals of the Greeks. The Apostle Paul, writing in the first century to Christians in the city of Corinth where the Isthmian Games were held, reflects this in his writings when he says, "Do you not know that in a race all the runners run, but only one gets the prize? Run in such a way as to get the prize", (1 Corinthians 9:24). Coubertin's assertion that the Games were the impetus for peace was also an exaggeration; the peace which he spoke of only existed to allow athletes to travel safely to Olympia, and neither prevented the outbreak of wars nor ended ongoing ones. Scholars have critiqued the idea that athletic competition might lead to greater understanding between cultures and, therefore, to peace. Christopher Hill claims that modern participants in the Olympic movement may defend this particular belief, "in a spirit similar to that in which the Church of England remains attached to the Thirty-Nine Articles of Religion, which a Priest in that Church must sign." In other words, that they may not wholly believe it but hold to it for historical reasons. Questions have also been raised about the veracity of Coubertin's account of his role in the planning of the 1896 Athens Games. Reportedly, Coubertin played little role in planning, despite entreaties by Vikelas. Young suggests that the story about Coubertin's having sketched the velodrome were untrue, and that he had in fact given an interview in which he suggested he did not want Germans to participate. Coubertin later denied this. 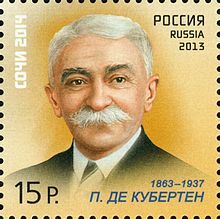 Pierre de Coubertin on a 2013 Russian stamp from the series "Sports Legends"
The Olympic motto Citius, Altius, Fortius (Faster, Higher, Stronger) was proposed by Coubertin in 1894 and has been official since 1924. The motto was coined by Henri Didon OP, a friend of Coubertin, for a Paris youth gathering of 1891. The Pierre de Coubertin medal (also known as the Coubertin medal or the True Spirit of Sportsmanship medal) is an award given by the International Olympic Committee to those athletes that demonstrate the spirit of sportsmanship in the Olympic Games. This medal is considered by many athletes and spectators to be the highest award that an Olympic athlete can receive, even greater than a gold medal. The International Olympic Committee considers it as its highest honour. A minor planet, 2190 Coubertin, was discovered in 1976 by Soviet astronomer Nikolai Stepanovich Chernykh and is named in his honour. The street where the Olympic Stadium in Montreal is located (which hosted the 1976 Summer Olympic Games) was named after Pierre de Coubertin, giving the stadium the address 4549 Pierre de Coubertin Avenue. It is the only Olympic Stadium in the world that lies on a street named after Coubertin. There are also two schools in Montreal named after Pierre de Coubertin. He was portrayed by Louis Jourdan in the 1984 NBC miniseries, The First Olympics: Athens 1896. In 2007, he was inducted into the World Rugby Hall of Fame for his services to the sport of rugby union. Coubertin, Pierre de (1900–1906). La Chronique de France (7 vols.). Auxerre and Paris: Lanier. pp. 7 v.
L'Évolution française sous la Troisième République. Études d'histoire contemporaine. Paris: Hachette. 1896. France Since 1814. New York: Macmillan. 1900. Retrieved 27 February 2018 – via Internet Archive. ^ "128 ans plus tard... Pierre de Coubertin de retour à Sciences Po". Sciences Po Executive Education (in French). Retrieved 29 January 2018. ^ "Les archives Pierre de Coubertin rejoignent Sciences Po". Archimag (in French). Retrieved 29 January 2018. ^ a b c d Hill 1996, p. 5. ^ "Ancestry of Pierre de Coubertin". Roglo.eu. Retrieved 9 October 2011. ^ MacAloon 1981, pp. 8–10. ^ MacAloon 1981, pp. 17–19. ^ MacAloon 1981, pp. 24–28. ^ MacAloon 1981, p. 21. ^ MacAloon 1981, pp. 32–33. ^ MacAloon 1981, p. 37. ^ Beard, Richard (2004). Muddied Oafs, The Soul of Rugby. London: Yellow Jersey Press. ISBN 978-0224063944. ^ Physical exercises in the modern world. Lecture given at the Sorbonne, November 1892. ^ Pierre de Coubertin. The Olympic Idea. Discourses and Essays. Editions Internationales Olympiques, Lausanne, 1970. ^ a b c d e Hill 1996, p. 6. ^ "Rugby in the Olympics:History". Archived from the original on 10 August 2011. ^ Hill 1996, p. 11. ^ a b Hill 1996, pp. 12–13. ^ a b c Hill 1996, p. 18. ^ a b Young 1996, p. 36. ^ Young 1996, pp. 73–74. ^ Hill 1996, pp. 13–15. ^ Streit, G. (1894). 'L'affaire Zappa. Paris: Paris, L. Larose. Retrieved 19 October 2016 – via Internet Archive. ^ Young 1996, p. 14. ^ a b c Hill 1996, pp. 7–8. ^ a b Hill 1996, p. 8. ^ "Randonneurs Ontario, Profile of Pierre Giffard". Randonneursontario.ca. Retrieved 25 August 2010. ^ "Féchain Athlétique Club, Association loi 1901-Affiliation à la Fédération Française d'athlétisme, Histoire". Home.nordnet.fr. 31 December 1982. Archived from the original on 25 November 2010. Retrieved 25 August 2010. ^ Hill 1996, p. 14. ^ Hill 1996, pp. 18–20. ^ Hill 1996, pp. 20–22. ^ Hill 1996, pp. 23–26. ^ Young 1996, p. 139. ^ Hill 1996, pp. 25–28. ^ Young 1996, p. 166. ^ Lipsyte, Robert (21 February 1999). "Evidence Ties Olympic Taint To 1936 Games". New York Times. pp. SP1 & SP3. Retrieved 10 July 2018. ^ Gjerde, Arild; Jeroen Heijmans; Bill Mallon; Hilary Evans (2011). "Pierre, Baron de Coubertin Biography and Olympic Results". Olympics. Sports Reference.com. Retrieved 7 March 2012. ^ "Pierre, Baron de Coubertin Bio, Stats, and Results". ^ "Pierre de Coubertin" (PDF). International Olympic Committee. p. 1. Retrieved 19 October 2016. ^ MacAloon 1981, p. 12. ^ Hill 1996, pp. 6–7. ^ Hill 1996, p. 7. ^ Hill 1996, p. 28. ^ Picard, Caroline (17 August 2016). "There's a 4th Kind of Olympic Medal and Only a Few People Have It: Yes, there's something better than gold". Town and Country. Retrieved 17 August 2016. ^ Schmadel, Lutz D. (2003). Dictionary of Minor Planet Names (5th ed.). New York: Springer Verlag. p. 178. ISBN 978-3-540-00238-3. ^ "École Pierre de Coubertin School". English Montreal School Board. Retrieved 21 June 2018. ^ "École primaire Pierre-De-Coubertin" (in French). Commision scolaire de la Pointe-de-l'île. Retrieved 21 June 2018. ^ O'Connor, John J. (20 May 1984). "Squeezing Inspiration from the 1896 Olympics". The New York Times. Retrieved 23 May 2018. ^ "Pierre de Coubertin". World Rugby Hall of Fame. Retrieved 21 June 2018. ^ MacAloon 1981, pp. 340–342. Hill, Christopher R. (1996). Olympic Politics. Manchester University Press ND. ISBN 978-0-7190-4451-9. MacAloon, John J. (1981). This Great Symbol: Pierre de Coubertin and the Origins of the Modern Olympic Games. Chicago: University of Chicago Press. ISBN 978-0-226-50000-3. Young, David C. (1996). The Modern Olympics, A Struggle for Revival. Baltimore and London: The Johns Hopkins University Press. ISBN 978-0-8018-5374-6. Macaloon, John J (2007) . This Great Symbol. Pierre de Coubertin and the Origins of the Modern Olympic Games (New ed.). University of Chicago Press. Routledge. ISBN 978-0415494946. Smith, Michael Llewellyn (2004). Olympics in Athens 1896: The Invention of the Modern Olympic Games. London: Profile Books Ltd. ISBN 978-1861973429. Stephan Wassong, Pierre de Coubertin's American studies and their importance for the analysis of his early educational campaign. Web publishing on LA84 Foundation. 2004. Wikimedia Commons has media related to Pierre de Coubertin.